Nancy Busch wanted something a little different from her mink fur coats. 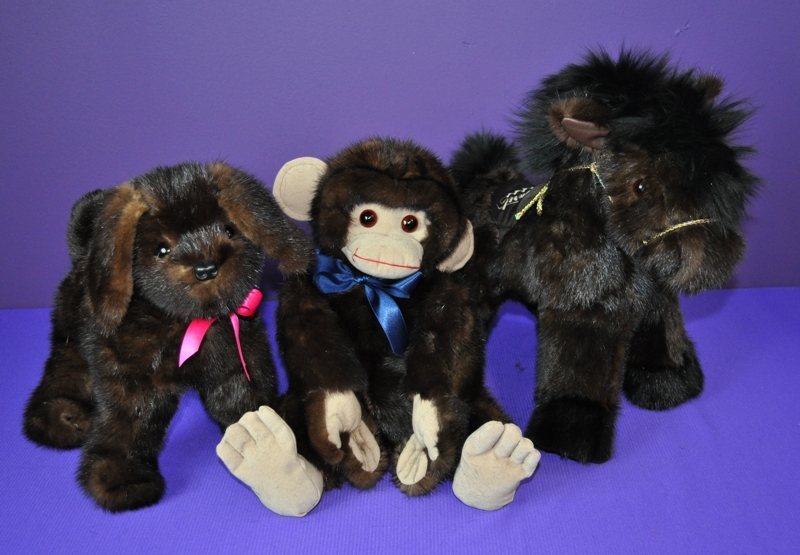 She wanted a Monkey, a Pony and a Dog–so that is what we made! People often ask about the patterns I use and, with my bears, it is complicated because the patterns are an amalgamation of several patterns that I combined and then, those patterns have morphed over the past 16 years as I adapted them to work with every kind of material thrown my way 🙂 However, I don’t get to do different animals that often in an average year so I usually use an existing pattern. This was the first time I’ve used this monkey pattern. I normally like to use the monkey pattern from the book Adventures in Toy-Making by Gillian Bradshaw-Smith (published in 1976). It is a fun pattern and I like the look. However, there was a pattern in another book I have Sew Soft and Cuddly Animals by Donna Childers (published in 1978) that has had me intrigued for some time so I decided to give it a try. It is a more difficult pattern, but I do like that the features are more defined. The face, ears, foot and hand pads are made of doe suede. It had the right texture to go with this fur.